Imaging plays an integral role in the detection, diagnosis, staging, and management of lung and pleural tumors. 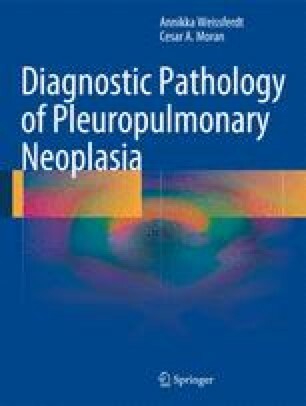 This chapter presents a general overview of lung and pleural tumor imaging and describes the advantages and limitations of the different imaging modalities, including radiographs, computed tomography (CT), positron emission tomography (PET), and magnetic resonance imaging (MRI), in the workup of intrathoracic neoplasms. It illustrates the typical radiologic appearances of pulmonary tumors, including features that help distinguish benign entities from primary and secondary lung and pleural cancers, with emphasis on the complementary role of radiology with histologic analysis of tumor tissue. This chapter explains patterns of metastatic disease from primary intrathoracic tumors in addition to lung metastases from extrathoracic neoplasms. The staging systems for primary non-small cell lung cancers (7th edition), small-cell lung cancer, and malignant pleural mesothelioma, as well as the new classification of lung adenocarcinomas, are discussed. The guidelines of the American College of Chest Physicians for imaging utilization in malignancy staging are presented. This chapter intends to guide the reader to the best choice of imaging studies, to appropriately manage patients with intrathoracic tumors for correct selection of patients for potentially curative surgery.